T’is the season to be stabbing. 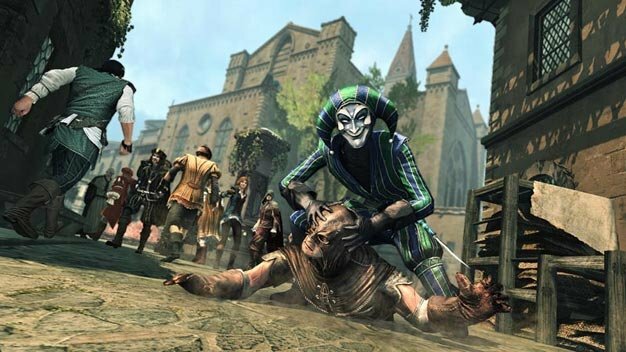 No, we’re not revisiting memories of horrific Christmases past, we’re talking about our giveaway of Assassin’s Creed: Brotherhood. HMV were kind enough to supply us with a PS3 copy of Ezio’s latest adventure, and we’re going to pass it on to you… if you win that is. Those not feeling lucky shouldn’t forget that they’ve got Assassin’s Creed Brotherhood in the shops for £39.99 this Christmas too. Want it? Need it? Bleed it? Then follow us on Twitter here and then retweet this post using the button below to be in with a chance of winning. Oh wait, you don’t like Twitter. Not to worry, you can instead ‘like’ Facebook page here and then retweet this post, just be sure to include your FB handle if you do it this way. Those looking to minimize Lady Luck’s influence can even retweet once per day. We’ll get in contact with the winner this Friday (Dec 3rd) so keep an eye on those incoming messages!